Bill to Ban Native Mascots in Public Schools in the Commonwealth Gaining Co-Sponsors – – Calls Needed Today!!! (HD 3645 / SD 937) “An Act Prohibiting the use of Native American Mascots by Public Schools in the Commonwealth” has been filed by Tami Gouveia (14th Middlesex) and Nika Elugardo (15th Suffolk) in the House and by Joanne Comerford (Hampshire – Franklin – Worcester) in the Senate. Calls and emails to your state legislators asking them to sign on to co-sponsor (HD 3645 / SD 937) before the Friday, Feb. 1st, 4 p.m. deadline are needed NOW. After the February 1st, 4 p.m. deadline, no new co-sponsors can be added in the House; the Senate may have some wiggle room…. Reps. Tami Gouveia (14th Middlesex); Jack Lewis (7th Middlesex); Denise Provost (27th Middlesex); Jason Lewis (5th Middlesex); Lindsay Sabadosa (1st Hampshire); Maria Duaime Robinson (6th Middlesex); and Sen. James Eldridge (Middlesex – Worcester). 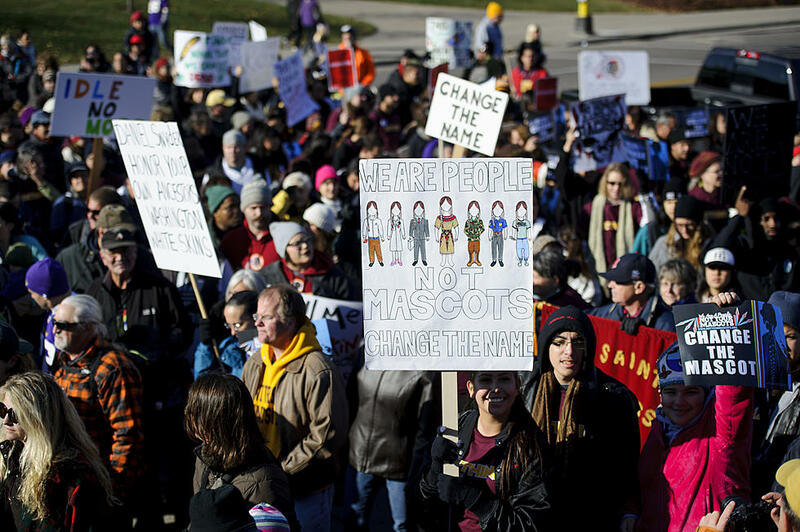 Call your legislator RIGHT NOW – use their statehouse phone number – and ask them to co-sponsor the bill to ban Native mascots in public schools. Ask them to commit to ending the harmful impacts of racial stereotyping in our public schools. Racial stereotypes harm us all. Sacred symbols like Eagle feathers are not playthings for sports teams to use without permission from the Native Nations of the Commonwealth, who have spoken strongly against the continued use of Native Mascots for sports teams. It is time to ban the use of Native sports mascots in public schools in Massachusetts, and everywhere. It is time to invite Native speakers, Native historians, cultural workers, artists and musicians into Massachusetts classrooms to educate our children, as part of a forward looking Native studies curriculum appropriate for all grade levels. Read more about the bill to ban the use of Native Mascots in Public Schools in the Commonwealth here. Next The list of co-sponsors is growing by leaps and bounds!